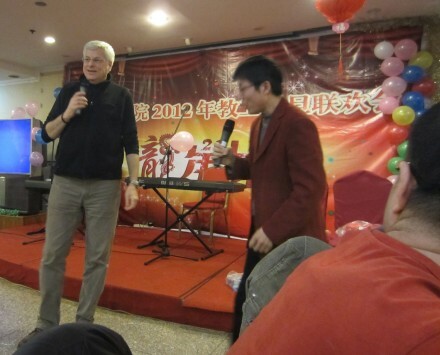 I have been spending the last two weeks of December teaching at Ludong University, a school of about 25,000 students in Yantai, China, a city of about 8 million in the northeast area of China on the southern shores of the Yellow Sea. 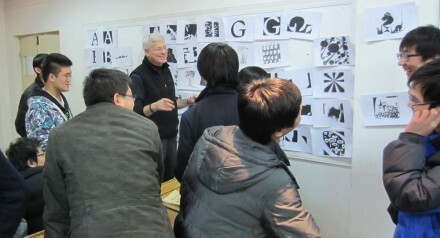 To the best of anyone’s knowledge here, this is the first time western faculty have been brought anywhere to China to teach graphic design. It is a terrific opportunity to elevate this school’s status in China and a delightful experience for me and for my colleague from the Shintaro Akatsu School of Design who preceded me for the first two weeks of December. This is a group shot of two of my classes meeting at once. Note the ream of A4 paper in the lower right corner of this photo. Paper is treated very carefully here in China. None is wasted. That is the ream of paper for students to use in this large class for these two weeks. Another interesting thing is that no students own their own printer. All printing is done at the on-campus pay-as-you-go printery, which is closed between 7pm and 8am. So getting work printed for an 8am class is part of the students’ process and requires forethought and planning. On the other hand, it makes the night before a critique a more relaxing time than students may be accustomed to in the States because if it isn’t printed by 7pm, it’s simply too late to do anything. Here is an image that should be familiar to my students: the question being considered is “what is right about your design decisions”? 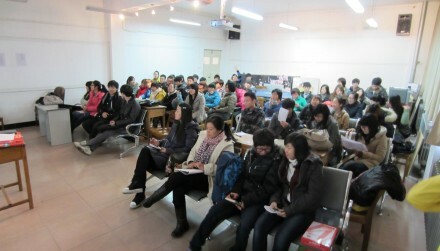 I have been teaching three classes, two using Latin characters and one using Chinese characters. As I anticipated, abstraction makes the difference in source material insignificant. That confirmation alone was worth the 13-hour flight. I addressed sixty professors in the School of Art, which includes the School of Music. This is an important point because the annual end-of-year dinner, shown here, includes entertainment by some of that School’s musicians and singers. It is a delightful and very collegial tradition. The gentleman on my left is Steve Xu, one of two extremely attentive members of the international exchange office and serving as my translator this evening. I took Professor White’s class here at Parsons and learned so much. I can tell by the crit wall in the photo above that he brought his same attention to detail to China. Its hard to imagine having limited supplies and printing resources, the students must be very good at time management.